This Sriracha egg salad with avocado mayo is perfectly creamy, a little bit crunchy and sizzling with that irresistible Sriracha spiciness. I never liked spicy flavors until I met Sriracha at a silent Vipassana meditation retreat a few years ago. I saw it sitting beside the other sauces at dinner and decided to try to be more openminded and courageous in my decision making (part of the reason I was at a meditation retreat in the first place). I had seen that bottle in my food store so many times, and I never thought to give it a try! The moment we broke silence after 10 days, my first words were, “Have you ever put Sriracha in your rice before?” I just had to tell the world! 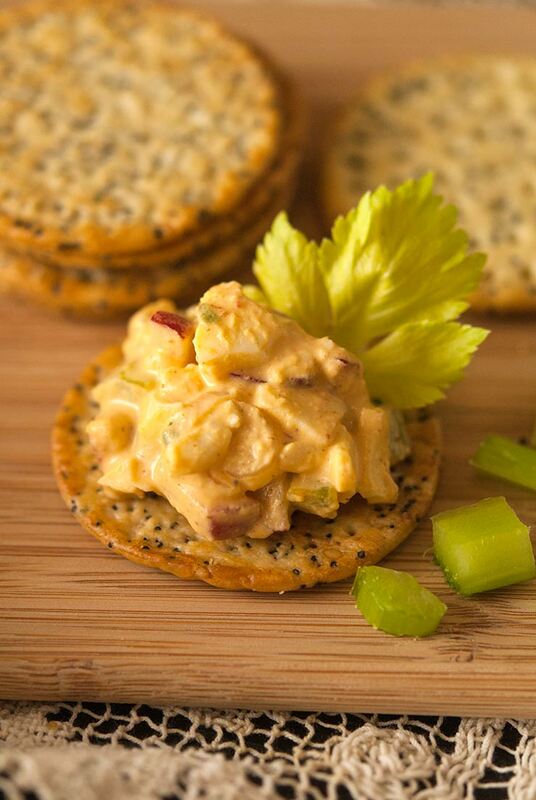 Some of the tastiest deviled eggs I make are Sriracha deviled eggs, and this egg salad is a deconstructed recipe. It can be served on crackers or on sandwiches with crispy lettuce. 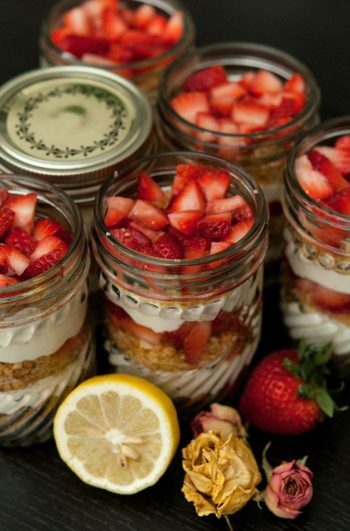 Definitely a show-stopper at any picnic or BBQ! • Don’t stir too vigorously when you’ve got your ingredients added. You don’t want your eggs to be too mushy. Just a gentle, slow stir will do. • This recipe calls for avocado mayonnaise but you can use traditional mayo too. 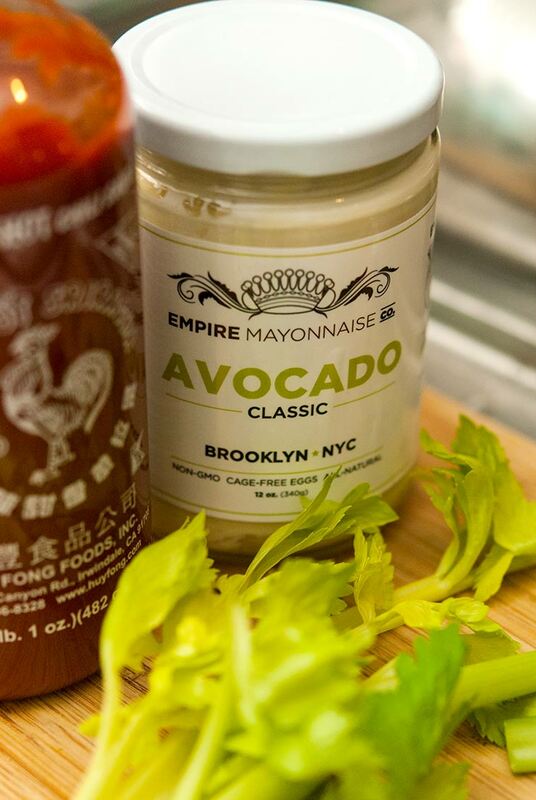 But avocado mayo is VERY tasty and bit healthier than traditional mayonnaise, inasmuch as it has less sodium and a few less calories from fat. A good avocado mayonnaise like this also lacks the usual unpronounceable ingredients and “natural flavors” of most mayos. But again, you can substitute traditional mayo too, and it’ll be just as tasty. • Make sure your eggs are properly cooled for at least 1-2 hours after boiling. If your eggs are still warm, they’ll warm your mayo when you mix it in which makes its oils separate in a not-so-appetizing way. 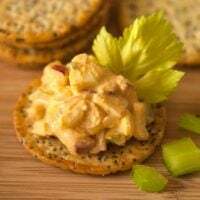 This recipe isn’t tooooooo spicy, so if you’d like your egg salad to have a spicier zing, simply add a bit more Sriracha and a few more shakes of cayenne pepper to heat it up a bit more. How Long Will This Egg Salad Last in the Fridge? It’ll be perfectly fine for at least 5 days if well-covered in the fridge. 1. Place 8 organic eggs in a pot, and cover with cold water. Turn on medium heat, and simmer for 20 minutes. Remove and cool eggs for at least an hour or 2 before cutting. 2. 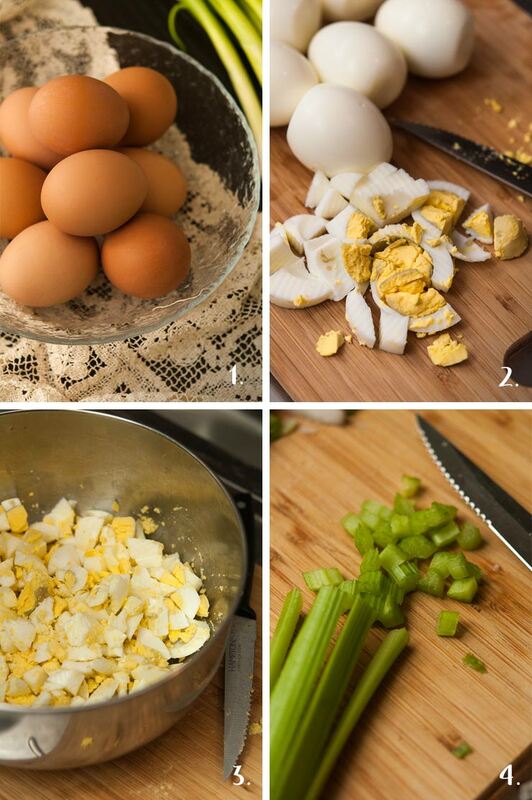 Once cool, chop your eggs into small pieces, roughly. Make sure not to mince, just coarsely chop. 3. Add your eggs to a mixing bowl and set aside. 4. Slice 4 celery sticks into 4ths and chop. You’ll want ½ cup of chopped celery. 5. Cut your green onion stems with a knife (or just use a pair of kitchen scissors) into nice, thin pieces. You’ll want ¼ cup of thinly sliced green onion. 6. 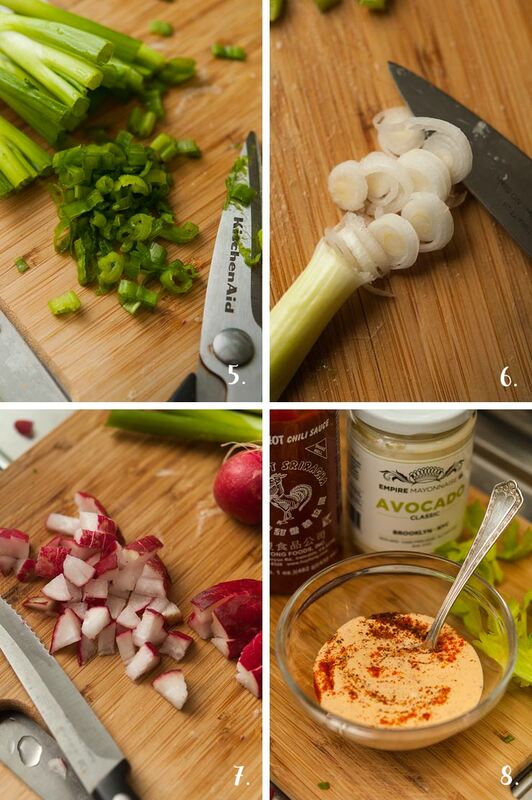 Thinly slice the bulbs of your green onion. 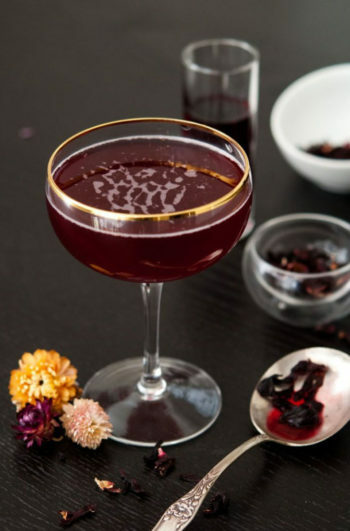 You’ll want at least a tablespoon or so. 7. Dice 7 medium radishes (or a good bunch) into tiny pieces, similar in size to your celery. 8. Add ½ cup of avocado mayonnaise, 1 tsp. of spicy brown mustard, 1 tsp. Sriracha, ⅛ tsp. cayenne pepper and a dash of smoked Spanish paprika to a small bowl. Sprinkle with a few dashes of salt and pepper. Stir, and add to your eggs. Carefully stir, then pour in all other veggies and mix it all together. 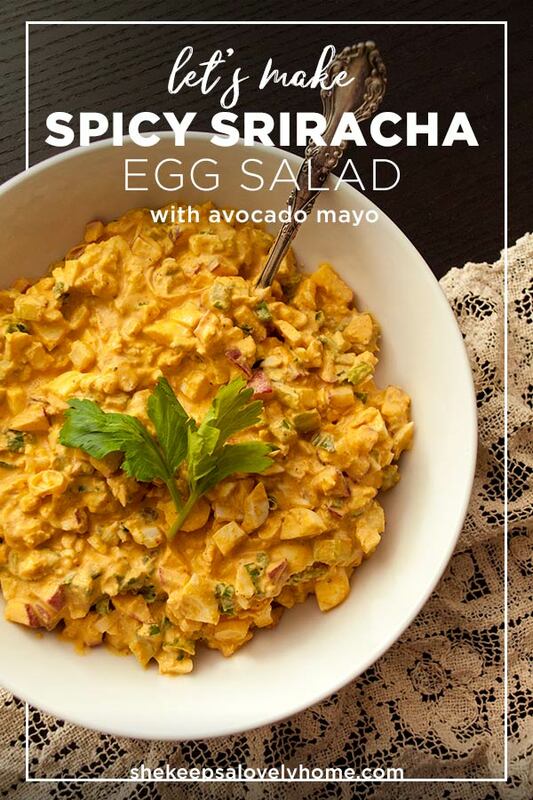 Serve and enjoy the spicy Sriracha egg salad sizzle! This Sriracha egg salad is perfectly creamy, a little bit crunchy and sizzling with that irresistible Sriracha spiciness. You'll require a medium-sized mixing bowl, a small bowl and a pot big enough to boil 8 eggs for this recipe. Place 8 organic eggs in a pot, and cover with cold water. Turn on medium heat, and simmer for 20 minutes. Remove and cool eggs for at least an hour or 2 before cutting. Once cool, chop your eggs into small pieces, roughly. Make sure not to mince, just coarsely chop. Add your eggs to a mixing bowl and set aside. Slice 4 celery sticks into 4ths and chop. 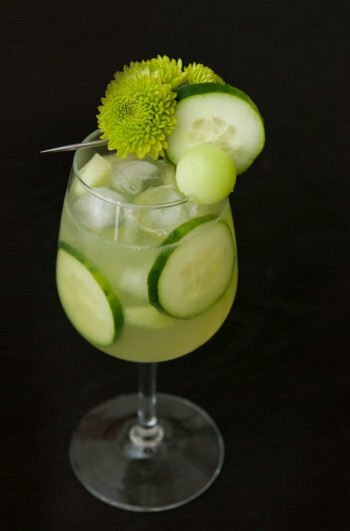 You’ll want half a cup of chopped celery. Cut your green onion stems with a knife (or just use a pair of kitchen scissors) into nice, thin pieces. You’ll want ¼ cup of thinly sliced green onion. Thinly slice the bulbs of your green onion. You'll want at least a tablespoon or so. Dice 7 medium radishes (or a good bunch) into tiny pieces, similar in size to your celery. Add ½ cup of avocado mayonnaise, 1 tsp. of spicy brown mustard, 1 tsp. Sriracha, ⅛ tsp. cayenne pepper and a dash of smoked Spanish paprika to a small bowl. Sprinkle with a few dashes of salt and pepper. Stir, and add to your eggs. Carefully stir, then pour in all other veggies and mix it all together.